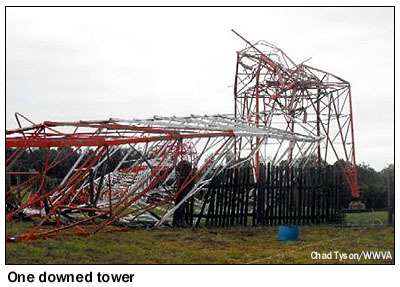 This week, we take a break from the recap of our 2009 Arizona/California excursion to cover some breaking news: on Wednesday afternoon, August 4, high winds took down all three self-supporting towers at the transmitter site of WWVA, Wheeling, WV (1170). We visited WWVA (from the outside only) in 2000, and featured the site in Tower Site Calendar 2003, but had never put this magnificent site up here as a Site of the Week - until now. 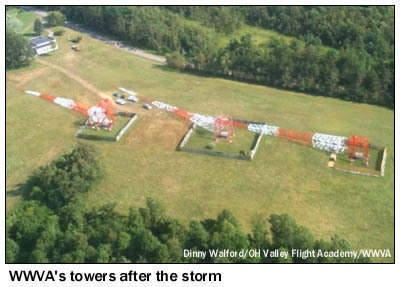 WWVA's site, as it stood until last week, was one of the most scenic directional arrays in the country, nestled along rural Barton Road in St. Clairsville, Ohio, about ten miles west of Wheeling across the Ohio River. The site was built in 1941-42 to replace an earlier location in Avalon, West Virginia, near West Liberty - but by then, WWVA was already an established big voice on the radio dial. The station traces its history to 1926, when John Stroebel put the station on the air from the basement of his Wheeling home, running just 50 watts. 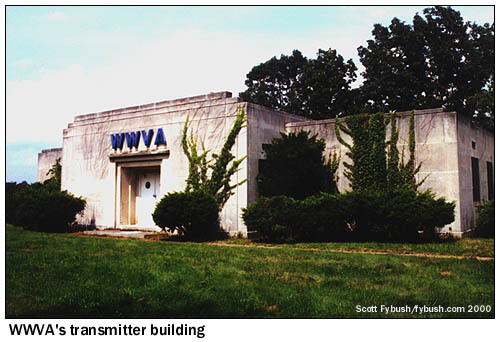 WWVA grew quickly, moving to 1160 in 1928 and a "superpower" 5000-watt signal in 1929. It almost left Wheeling in 1930, when new owners sought to move it to Charleston, but an established Charleston station, WOBU (today's WCHS) fought off the incursion and WWVA stayed put. 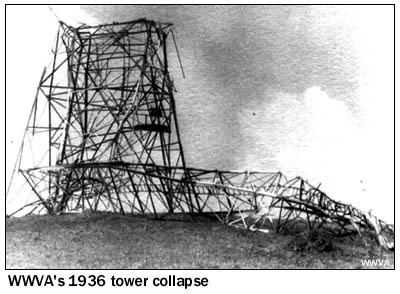 The Avalon transmitter site suffered a disaster of its own on July 28, 1936, when winds estimated at as high as 100 miles per hour took down the pair of 225-foot self-supporting towers that held WWVA's long-wire antenna. 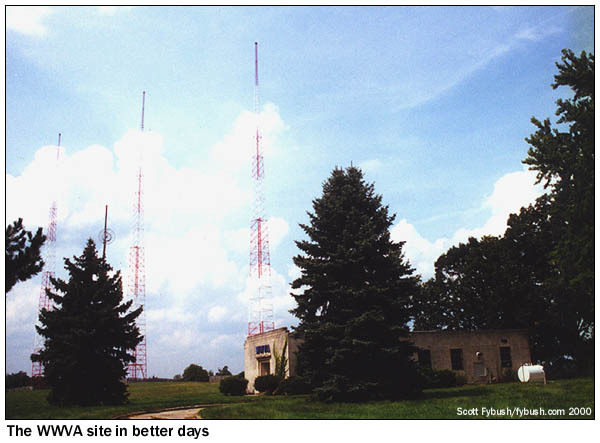 By the next morning, WWVA was back on the air from a temporary antenna at Avalon, and the site was soon rebuilt, though it didn't remain in use very long. 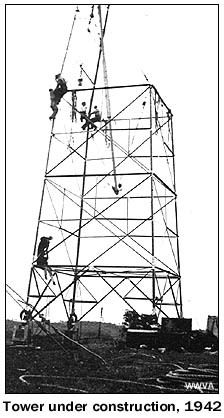 The NARBA shift of 1941 slid WWVA from 1160 up to 1170, ending a share-time arrangement that had paired the Wheeling station with WOWO in Fort Wayne, and the FCC soon granted WWVA a power increase to 50,000 watts, with a directional array that would allow WWVA to co-exist with another 50,000-watt signal on 1170, KVOO in Tulsa. Construction continued through the summer of 1942 on the new transmitter site at St. Clairsville, which featured a very solid-looking (almost mausoleum-esque) transmitter building and three 408-foot self-supporting towers. 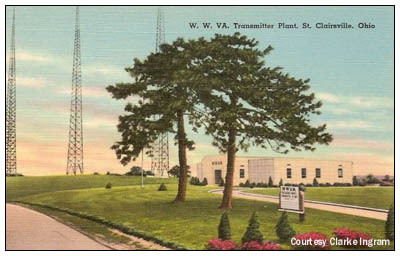 In any event, the new towers went on the air October 8, 1942, and for many decades thereafter WWVA was one of the strongest signals up and down the East Coast at night, broadcasting the "WWVA Jamboree" from its home at the Capitol Music Hall, as well as daily reports letting miners know which of West Virginia's coal mines were operating on which shifts, as well as lots of late-night preachers who helped to pay the station's bills over the years. 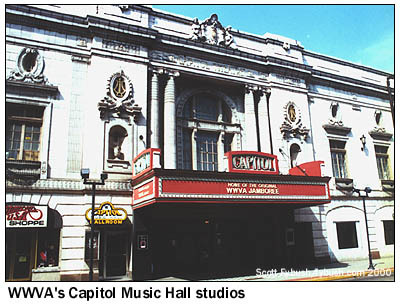 WWVA changed owners over the years, including Columbia Pictures/Screen Gems and Price Communications, but things remained pretty stable for a long time in Wheeling. Even after Jacor (and then Clear Channel) took over in the 1990s, change was slow to come to WWVA, though it eventually did. The station's long association with the Jamboree and the Capitol Music Hall came to an end, and its format eventually moved from country music to news and talk, some of it originating down the road at Pittsburgh's WPGB. 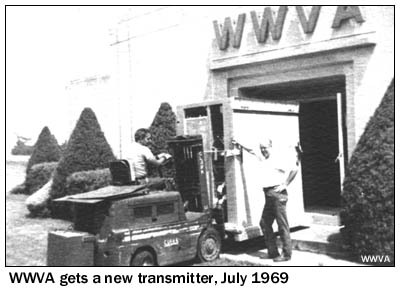 There was even a plan at one point to move WWVA out of Wheeling. An application was filed to move the station to Stow, Ohio, a suburb of Akron. If consummated, the relocation would have turned 1170 into a Cleveland-market 50-kilowatt signal, a move that prompted local opposition in West Virginia, one of several factors that contributed to the plan's being abandoned and WWVA staying put in Wheeling. And through it all, those three big towers in St. Clairsville stood proud and tall (and even featured on the occasional tourist postcard, as seen at right) above the rolling hills near the Ohio River - until the winds started to kick up on the afternoon of August 4. Weather reports indicated that there was no tornado that afternoon, but rather some combination of intense straight-line winds (as strong as 70 miles per hour) and a downburst that sent the towers tumbling to the ground after almost 70 years in the air. As we write this on Friday morning, engineers are working hard to get WWVA back on the air. It returned temporarily from a makeshift antenna on Thursday night, but then went silent again overnight. In the meantime, the station's programming is being heard on sister station WBBD (1400 Wheeling) - and someday soon, we hope, that 50,000-watt voice will once again ring out loud and clear from new towers at St. Clairsville. - Find out when the new Tower Site is posted, and much more! Follow us on Twitter @NERadioWatch - and don't miss your chance to pre-order the all-new Tower Site Calendar 2011 at the Fybush.com store!